2015 Comic-Con Photos, News, and Videos | Just Jared Jr.
Willa Fitzgerald hits the red carpet at Entertainment Weekly’s Annual Comic-Con Party held at FLOAT at The Hard Rock Hotel on Saturday night (July 11) in San Diego, Calif. The 24-year-old Scream actress joined her co-stars Amadeus Serafini, John Karna and Connor Weil at the bash after stopping by SiriusXM earlier in the day. During the party, the Scream cast met up with Heroes Unborn‘s Danika Yarosh, Robbie Kay and Gatlin Green. FYI: Connor is wearing a John Varvatos shirt, jacket and boots. The 100's Eliza Taylor is a Fan Favorite at Comic-Con 2015! Eliza Taylor wears headphones around her neck while touching down at the airport on Sunday (July 12) in Vancouver, Canada. The 25-year-old actress is back in town to continue filming the new season of her CW show The 100. The day before, Eliza participated in the TV Guide Magazine: Fan Favorites Panel during 2015 San Diego Comic-Con held at the San Diego Convention Center in San Diego, Calif.
Also on the panel were The Walking Dead‘s Norman Reedus, Community‘s Yvette Nicole Brown, iZombie‘s David Anders, The Goldbergs star Wendi McLendon-Covey, Game of Thrones‘ Maisie Williams, and Agents of S.H.I.E.L.D. actress Ming-Na Wen. Lily James and Bella Heathcote get dolled up to attend the Entertainment Weekly Party held during 2015 San Diego Comic-Con at FLOAT at The Hard Rock Hotel on Saturday night (July 11) in San Diego, Calif. The Pride and Prejudice and Zombies co-stars were joined by Everest actress Elizabeth Debicki, The Danish Girl‘s Alicia Vikander, and Game of Thrones actors Maisie Williams, Carice van Houten, and Liam Cunningham. FYI: Elizabeth is wearing a Roland Mouret dress, Stuart Weitzman shoes, and Jen Meyer jewels. Bella is wearing Paula Cademartori shoes. 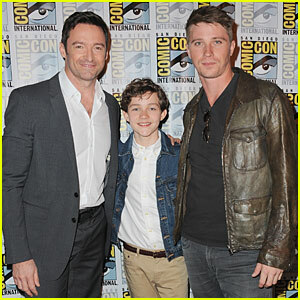 Hugh Jackman, Garrett Hedlund and pint-sized Pan star Levi Miller walk the press line during 2015 Comic-Con on Saturday (July 11) in San Diego, Calif.
Pan director Joe Wright was also in attendance to give the audience the low down on the upcoming film. In the movie Hugh, who often portrays a superhero, is given the opportunity to play to play the bad guy in his role as the pirate Blackbeard. Both Hugh and Joe explained that the film tried to showcase the idea that adults are often “frightening and ridiculous” to children and it was important for the perspective of the film. Pan is set to be released this September. The 'Power Rangers' Hit Comic-Con 2015! The cast of Power Rangers: Dino Charge get together for a fun photo opp at the Bandai America Inc. booth at 2015 San Diego Comic-Con on Friday (July 10) in San Diego, Calif. The stars – Yoshua Sudarso, Michael Taber, James Davies, Brennan Meija, Camille Hyde, and Claire Blackwelder – are busy promoting new episodes, which start airing again in August. The day before, the cast participated in a panel for fans at the San Diego Convention Center. 'Scream Queens' Details Revealed at Comic-Con 2015! Lea Michele and her co-star Emma Roberts arrive for the Scream Queens panel at 2015 Comic-Con on Sunday (July 12) in San Diego, Calif. The pair were joined by all the stars of the series including Abigail Breslin, Billie Lourd, Jamie Lee Curtis, Keke Palmer, and Skyler Samuels. Creator Ryan Murphy was also in attendance. The American Horror Story cast had a joint panel with the Scream Queens ladies – Evan Peters and more joined the large group on stage! See all the photos below. FYI: Emma is wearing a Tanya Taylor dress, Bionda Castana shoes, and Jennifer Meyer jewelry. Lea is wearing a Jonathan Simkhai top and skirt, Christian Louboutin shoes, Jennifer Meyer earrings, and EF Collection and Melissa Kaye jewels. Abigail is wearing Nissa earrings. QUIZ: Which ‘Total Eclipse’ Character are You? Paula Patton Debuts New Perm Haircut!